STAR WARS (ACADEMY AWARDS VERSION) - BRITISH QUAD (30"x40")ORIGINAL MOVIE POSTER FROM 1977. POSTER IS IN EXCELLENT CONDITION AND ROLLED. THIS POSTER IS NOT A REPRO OR REPRINT , THIS IS AN ORIGINAL THEATRICAL MOVIE POSTER PRINTED BY THE STUDIOS. 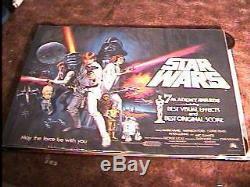 The item "STAR WARS ROLLED ACADEMY AWARDS B QUAD MOVIE POSTER'77" is in sale since Sunday, March 23, 2008. This item is in the category "Entertainment Memorabilia\Movie Memorabilia\Posters\Originals-International\1990-99". The seller is "tloceposters" and is located in Rochester, NY. This item can be shipped worldwide.